Brian is maybe one of the most ashamed dogs we’ve ever seen. It’s almost enough to make us feel bad for shaming him. Almost. Oh my goodness! This poor guy is sooo sorry. I’m not saying he wouldn’t do it again in a hot minute, but in the moment he was caught, he was the sorriest dog there ever was! <3 I'd have to forgive him, then hug him and shower him with smooches! Yes – I’d probably have to re-stuff the elephant and give it back to him! 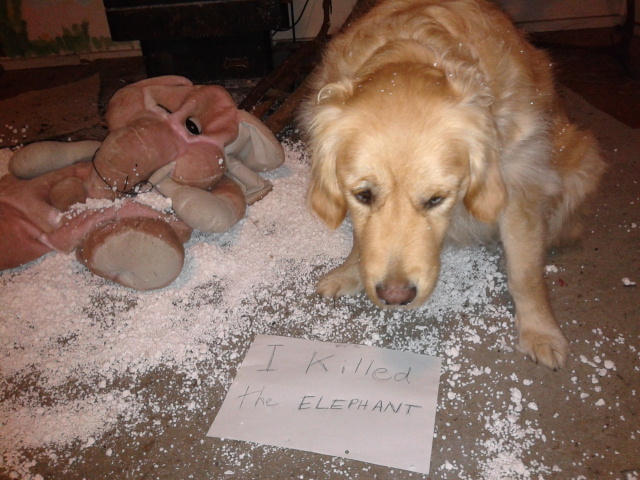 How many dogs are loyal and tough enough to kill an elephant that invaded your house and could have severely injured HIS family . This pup should be praised a a HERO. Yes! Exactly! He is keeping the house safe & elephant-free. You and George Orwell, Brian. I am so proud my boy made the website! He has been trying sooo hard to get on…. eating pot plants, spreading expensive mineral supplements meant for my horse all over the yard and eating the grocery shopping. I will tell him he can stop now.